One of those really simple and lovely meals tonight. Just a couple of sea bass thrown in the oven, lemon slices and thyme stuffed inside, some lemon zest, sea salt and olive oil thrown over them and then roasted for half an hour or so. I threw some spring greens in the wok with some lemon juice and I was done. You don't know how deliriously happy a meal like this makes me. A bottle of white Burgundy cracked open and Johnny Cash on the stereo. Y'know what? Wow. Just wow. Fish in the oven. Gotta try that. That fish recipe sounds so simple I think even I could give it a whirl. Am normally rather cautious about cooking seafood. I am going to bookmark you to remind myself that there is more to the dinner table than vegemite on toast! I love the photos too, thanks. I just came across your blog and it is really beautiful. The photos are stunning. I look forward to checking back for future posts. Great photo and a simple recipe. Have to try fish in the oven next weekend. I enjoyed your blog! can I come for supper next time I'm in the UK? Last time I was there I lived on yogurt with one exhorbitant meal at Moro. 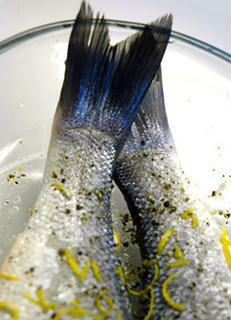 Hi Monkey Gland - I don't want to sound cheeky but your sea bass looks prettier than mine ;) Great shot.